State-of-the-art conference and business training center. 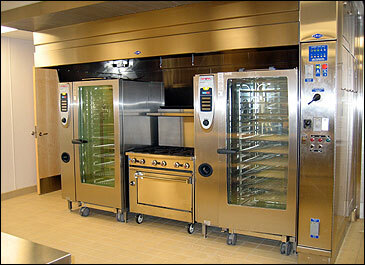 For this project, PFDI was required to design a catering kitchen that could handle events and groups of 10 to 350. Allocated 2,131 sq. ft. for the kitchen and staging areas, our team made the best use of the space without compromising equipment or a comfortable work environment. The design team accepted the challenge of incorporating a buffet counter in the 1,875 sq. ft. executive conference room. The achieved goal was to have the flexibility of serving hot meals and beverages without becoming a distraction or take away from the professional feel of the room. PFDI also designed a 370 sq. ft. full service coffee bar along with a washroom.